This is a reminder to all of my readers about how delicious these grilled chicken meatballs are. They are easy to make, and easy to eat—who doesn’t love food on a stick! 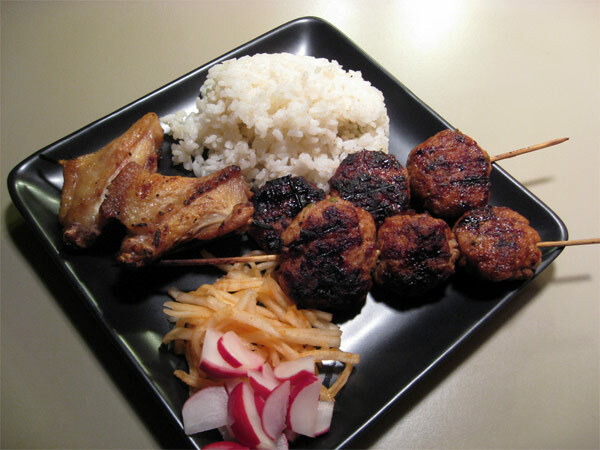 The pictures make the skewers look burned, but that is in fact the yakitori sauce that flavors the outside of the meatballs. Chop chicken to a paste with a heavy-duty knife or a food processor. Transfer to a medium bowl and add the salt. Squeeze the mixture with your hands until the mixture becomes sticky and pale pink in color. One at a time add the black pepper, onions, ginger, and egg white. Squeeze the mixture after each addition. Add the sesame oil and mix. I put this mixture into the refrigerator for about 20 minutes to chill. 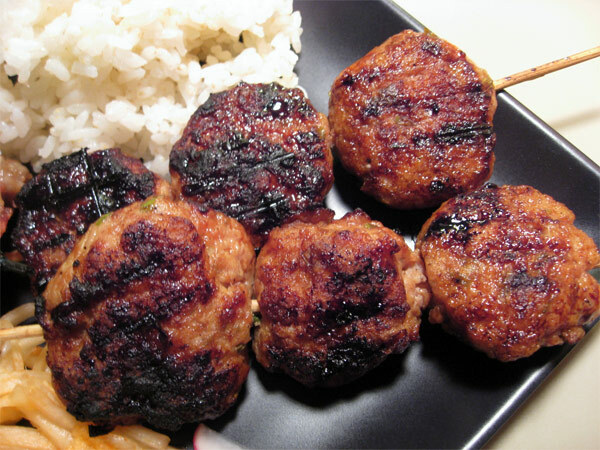 Oil your hands and form the ground chicken into 1 1/2 inch balls. I made 24, so they may have been a little smaller than the original recipe. As you form the dumplings, place them on a large oiled plate and press a small depression in each to facilitate even cooking. When you have shaped all of them, heat a large heavy skillet over medium-high heat. Coat the bottom of the skillet with a film of oil and fry the dumplings in batches over medium low heat. Don’t cook them all the way through: you only want to cook them until they turn white and firm on all sides. Drain the dumplings on paper towels. Let them rest for 10 minutes. Or you can prepare the recipe to this point and finish cooking later in the day. Let the dumplings come up to room temperature, about 20 minutes. Thread three dumplings on each skewer. Grill or broil until golden, turning once. Dip the skewers in the yakitori sauce. Shake off excess sauce and grill until dry, about a minute or two. Repeat the dipping and drying process, and then remove the dumplings from the heat and baste them once more. Serve hot, sprinkled with sansho pepper. To be honest, I did not actually cook this meal. I prepped the chicken wings, made the meatballs, marinated the daikon, then lost interest in eating dinner, fell asleep, and Mr. Tess grilled with the assistance of my avatar. 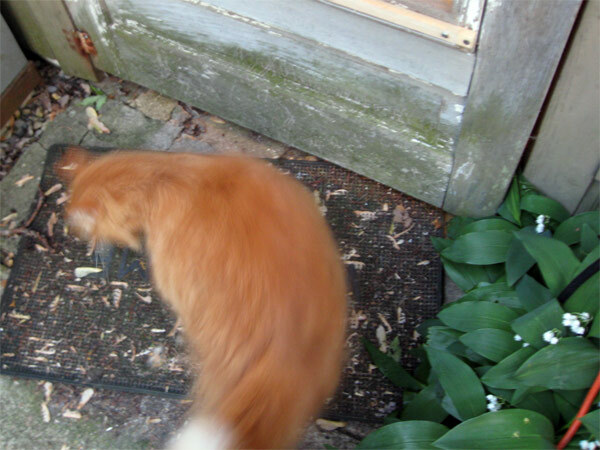 That is Gracie the orange cat. He took the picture, and didn’t adjust the macro focus to normal, the shutter speed to fast. The blur is appropriate for the way I’m feeling these days. Depression does make a person unfocussed, sort of like being in a tail spin. I mentioned this condition the other day, just talking to myself in public (as public as this blog anyway). It seems I did not realize how hopeless I’d become. But I’ve started taking the magic pills my doctor prescribed way back in February—there I was sitting in her office with tears running down my cheeks (not my most attractive look)—thinking that I don’t need any drugs, and I hope they’ll start kicking in soon. I’m not asking for sympathy, nor making excuses for how difficult I am to live with. Just reminding myself to come to terms with this. I do understand that this might take a while and I hope the topic does not become tiresome. Even so, I’m touched and overwhelmed by the caring response from all the people in the forum (and via emails). Thanks for the hugs, prayers, advice, encouragement, and all. The Korokke is a sort of once every other year type of recipe once you are past age 16! I hope you try the recipe and let me know how you like it. Your blog is beautiful, by the way. 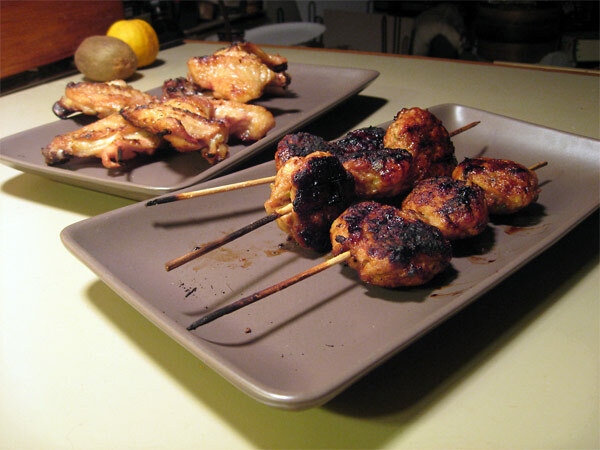 Do take the trouble to make your own yakitori basting sauce. It is worth it!